I have devoted an entry, "The West Bank to Jordan, Gaza to Egypt," to those voices (including mine) who have given up on the two-state solution and instead advocate for or against the idea that the Jordanian and Egyptian governments take over, respectively, the West Bank and Gaza. But this leaves out the growing debate over the two-state solution that does not mention the Jordan-Egypt option; their ideas will be recorded here, as a complement to the original weblog entry. The second step must be an armistice that would offer each side what they crave for the present—Israel would get quiet and a limit on arms to Hamas; Palestinians would get open borders, a freeze on settlements, and an opportunity to rebuild their shattered institutions. Such an armistice must go beyond a one-year cease-fire to become something sustainable for at least five to ten years. Finally, the calm provided by the armistice must be used to rebuild Palestinian institutions and force Palestinians and Israelis to confront rather than avoid the choices before them. Comment: One has to wonder what planet Brown lives on, making plans on the basis that Hamas can be tamed and made to accept the existence of a sovereign Jewish state between the Mediterranean Sea and the Jordan River. Feb. 17, 2009 update: Giora Eiland, a leading Israeli strategist, has issued a study, "The Future of the Two-State Solution," in which he calls the two-state solution "a big illusion." In its stead, he offers a baroque plan whereby Cairo grants Gaza 600 sq. km. of its territory, Jerusalem annexes 600 sq. km. of territory on the West Bank and it grants a final 600 sq. km. of territory in the Negev desert to Egypt. Eiland does not explicitly say this last tranche would cut Israel in two, but that is implied when he writes that "Egypt could get a land corridor to enable movement from Egypt to the rest of the Middle East without the need to cross Israel." Comment: This has to be concurrently the least likely and least good idea anyone has come up with lately. Mar. 4, 2009 update: In a much less baroque analysis, "No chance for 2 states." Eiland dismisses this idea as "a bad solution" that "will likely never be achieved," then gives his reasons for this negative appraisal. Q. What do you say when asked if you believe in a two-state solution as George Bush outlined in 2002? A. Substantively, I think there is broad agreement inside Israel and outside that the Palestinians should have the ability to govern their lives but not to threaten ours. 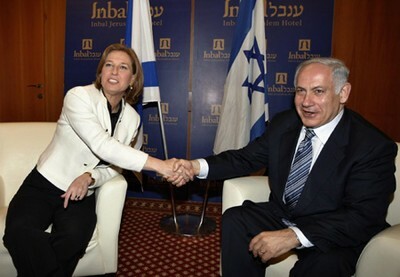 Israel's Likud party leader Benjamin Netanyahu (R) shakes hands with Foreign Minister and Kadima party leader Tzipi Livni in Jerusalem February 22, 2009. Mar. 1, 2009 update: Emerging from unsuccessful talks with Netanyahu to form a Likud-Kadima government, Tzipi Livni of Kadima blamed their failure in large part on Netanyahu's unwillingness to commit to pursue a two-state solution. Israel is facing challenges and I told him that Kadima would support the correct moves made by the government. But to deal with the challenges, I wanted three basic principles that you know about. Two states for two peoples is not an empty slogan. It is the only way Israel can remain Jewish and fight terrorism. It's a fundamental issue. ... This meeting has ended without agreements on issues that I see as essential. Mr. Sharon decisively won re-election in January 2003 over Amram Mitzna, a Labor opponent who advocated an Oslo-style unilateral retreat from Gaza. Mr. Sharon unambiguously condemned this idea back then: "A unilateral withdrawal is not a recipe for peace. It is a recipe for war." After winning the election, his talks in February 2003 about forming a coalition government with Mr. Mitzna failed because Mr. Sharon so heavily emphasized the "strategic importance" of Israelis living in Gaza. By December 2003, however, Mr. Sharon himself endorsed Mr. Mitzna's unilateral withdrawal from Gaza. So, coalition talks are a good but not entirely reliable guide to future policy. Netanyahu also has a tactical reason for objecting to a Palestinian state: He believes that this must come through negotiations, rather than being something conceded by Israel in advance. He considers the Annapolis process that outgoing prime minister Ehud Olmert and Foreign Minister Livni conducted with the Palestinian Authority's Mahmoud Abbas and Ahmed Qureia to be a joke. In his opinion, Israel must not offer a near-total withdrawal from the West Bank in advance, which he believes would achieve nothing and only encourage the Palestinians to demand more. 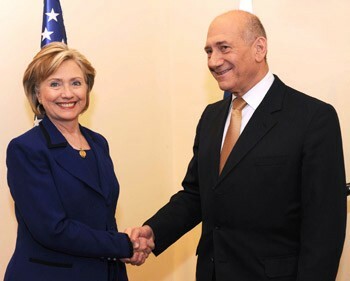 Hilary Clinton and Ehud Olmert. I will share with the Secretary of State the position my Government has taken to advance peace between us and the Palestinians, and together we will discuss ways to advance peace in the region as part of the two-state solution. This is the only solution - there is no doubt - and it reflects absolutely Israel's supreme strategic interest as well as the interest of the Palestinian people. Mar. 5, 2009 update: Aaron Lerner credits Binyamin Netanyahu for not giving in on the 2-state solution during recent negotiations with Kadima. Binyamin Netanyahu surprised many of his detractors in the national camp when he took the high road on the "two state solution" after being assigned by President Peres to form a government. Netanyahu could have tried to get away with saying "two states" while mumbling under his breath that the "Palestinian state" would be an "autonomous" rather than fully "independent" state. But he didn't. Instead he took the high road and declined to recite that holy mantra "two state solutions". EU foreign policy chief Javier Solana: "Let me say very clearly that the way the European Union will relate to an [Israeli] government that is not committed to a two-state solution will be very, very different." Czech Foreign Minister Karel Schwarzenberg, whose country currently holds the EU presidency: if the new Israeli government does not commit itself to establishing a Palestinian state, "relations would become very difficult indeed. At one of our next ministerial meetings we would have to discuss what consequences the EU would draw from that. Both parties must stick to their commitments from the past: A two-state solution and all agreements reached over the past few years." support for the two-state idea is especially evident when comparing it to two other possibilities: continuing the existing situation or establishing a binational state. Among the Jews, 51% now back the two-state formula, 28% favor continuing the existing situation, and only 7% are for setting up a binational state. For the Arabs the parallel figures are 66% for the two-state formula, 8% for continuing the existing situation, and 17% for binationalism. Confusing because it's not clear if Jewish Israeli support for the two-state solution is 56 percent or 51 percent. In any case, it makes up a majority. Apr. 10, 2009 update: Writing for the far-leftist Inter Press Service, Helena Cobban gives up on the two-state solution and instead advocates "a single bi-national state between the Jordan River and the Mediterranean, in which both Hebrew-speaking Jewish Israelis and Arabic-speaking Palestinians would have equal rights as citizens, and find themselves equally at home." Apr. 17, 2009 update: George Mitchell announced today in Israel: "U.S. policy favors, with respect to the Israeli-Palestinian conflict, a two-state solution which will have a Palestinian state living in peace alongside the Jewish state of Israel." With the two-state solution, in my opinion, Israel will collapse, because if they get out of Jerusalem, what will become of all the talk about the Promised Land and the Chosen People? What will become of all the sacrifices they made - just to be told to leave? They consider Jerusalem to have a spiritual status. The Jews consider Judea and Samaria to be their historic dream. If the Jews leave those places, the Zionist idea will begin to collapse. It will regress of its own accord. Then we will move forward. July 2, 2009 update: According to Zogby International – whose slogan should be "interesting if true" – polls of Israelis, Palestinians and Americans shows wide support for the two-state solution. Aug. 18, 2009 update: Mike Huckabee, a former governor of Arkansas and candidate for president, opposes the creation of a Palestinian state. "The question is should the Palestinians have a place to call their own? Yes, I have no problem with that. Should it be in the middle of the Jewish homeland? That's what I think has to be honestly assessed as virtually unrealistic." rejected the creation of an Arab state west of the Jordan River saying the right of the Jewish people to their ancestral homeland was 'obvious' and that such a state would become a 'haven of impunity' for terror. ... "I think any second state of any nature, another sovereignty west of the Jordan River, especially when it comprises the PLO or Hamas, would negate or contradict two basic rights of the Jewish people and the citizens of Israel. One is the right of the Jewish people to our homeland, and our right to our homeland does not stop exactly east of the 1949 armistice demarcation lines, also known as the "Green Line." It has no historic significance whatsoever. It just marks a balance of military power back then, in 1948 or 1949, between [Israel's] local Arab neighbors and the newborn state of Israel in their attempt to smother the baby state in its cradle. Our right to our land – including of course to the cradle of our history in Judea and Samaria – is obvious. There is also the question of national security, and we have had some experience in the the last twenty years under the banner "territory for peace"... the actual events have been territory for terror. Every piece of land, every hectare, every acre, that was consigned to the PLO reign, became a haven of impunity for terrorism. And we should anticipate that once we transfer parts of our homeland to the PLO it will be, actually, an indirect transfer of land through the PLO to Hamas, and to Iran. Begin did not offer an alternative solution. July 15, 2011 update: The Israel Project commissioned American pollster Stanley Greenberg and the Palestinian Center for Public Opinion to probe Palestinian sentiments on the two-state solution and found that only 34 percent of them accepts this resolution. Completed this week, the survey was intensive and face-to-face, in Arabic, and included 1,010 Palestinian adults in the West Bank and the Gaza Strip and has a margin of error of 3.1 percentage points. Jan. 3, 2013 update: A poll by Geocartography of a representative sample of adult Israelis (including Arabs) asks the question "Do you support or oppose the concept that the establishment of two states is the solution to the conflict with the Palestinians?" In reply, 40 percent support the concept, 45 percent oppose, and 14 percent do not reply. Apr. 17, 2013 update: Cheery news: Secretary of State John Kerry told the House Foreign Affairs Committee today: "I believe the window for a two-state solution is shutting ... I think we have some period of time - a year, a year-and-a-half, two years - or it's over." Let's hope that Klueless Kerry gives up this quixotic quest by late 2015. Sep. 17, 2013 update: Proving that it's becoming ever more eccentric, the New York Times published an opinion piece today, "Two-State Illusion" by the loopy Ian S. Lustick of the University of Pennsylvania. Starting from the false premised that "All sides have been wedded to the notion that there must be two states, one Palestinian and one Israeli," he goes on to argue that Israel may well be a temporary phenomenon by noting "how quickly the Soviet, Pahlavi Iranian, apartheid South African, Baathist Iraqi and Yugoslavian states unraveled," as though Israel had anything in common with those tyrannies. In such a radically new environment, secular Palestinians in Israel and the West Bank could ally with Tel Aviv's post-Zionists, non-Jewish Russian-speaking immigrants, foreign workers and global-village Israeli entrepreneurs. Anti-nationalist ultra-Orthodox Jews might find common cause with Muslim traditionalists. Untethered to statist Zionism in a rapidly changing Middle East, Israelis whose families came from Arab countries might find new reasons to think of themselves not as "Eastern," but as Arab. Comment: How embarrassing to recall that I was a steady contributor to the New York Times between 1980 and 1996.
are in revolt against the international community's long-held consensus that there should be two states between the Jordan River and the Mediterranean Sea. In the process, they are seeking to overturn the commitments of every U.S. president since Bill Clinton and at least four Israeli prime ministers, including the current one. These opponents, they report, are no longer simply negative about the two-state idea but "are preparing details of their own vision for how Israel should proceed unilaterally." The article then specifies the views of each of the politicians named above. Dec. 12, 2014 update: According to a Times of Israel report by Haviv Rettig Gur, Yair Lapid of Israel's Yesh Atid party sees a similar solution to the Palestinian issue: "Egypt can help secure Gaza and Sinai, and Jordan wields some influence over the West Bank and East Jerusalem." Mar. 30, 2015 update: A Washington Post-ABC News poll finds that American support for a Palestinian state is at a low - only 39 percent. Aaron Blake of the Washington Post writes that this "is the lowest that number has been in WaPo-ABC and Gallup polling since 1998." The renewed talk about a confederation between the Palestinians and Jordan underscores the Palestinian leadership's failure to convince many Palestinians of its ability to lead them towards statehood. Aug. 14, 2018 update: A new poll by the Tel Aviv University and the Palestinian Center for Policy and Survey Research finds a new low in support for the two-state solution: 43 percent among both Israelis and Palestinians.